I thought I must write to you because the no-confidence motion you brought against the Green Man appears to have boomeranged on you- although most of your ‘pohottuwa’ chaps are still trying to keep a straight face and act as if you won the vote, despite having lost it by a huge margin. Usually, Mahinda maama, you are quite good at manipulating situations to your advantage. We remember how you got the courts to declare that Satellite’s second term of office was over, a year earlier than she thought it would be. You also divided the Greens by offering them Cabinet posts. Even after you lost the top job, you didn’t retire into the backwoods of Medamulana. Instead, you mobilised people against Maithri and the Green Man, although you were helped to a great extent by those in ‘yahapaalanaya’ who seem very talented at creating an absolute mess by themselves. You seem to be well on the way back after the results of the recent elections were announced. The ‘pohottuwa’, though only still beginning to bloom, swept the board. The Greens came a distant second and Maithri’s Blues were nowhere to be seen. The results may have surprised even you! So, when you and your ‘pohottuwa’ chaps came up with this no-confidence motion against the Green Man, we thought you had another smart plan up your sleeve. You would have loved to oust the Green Man and have someone like Nimal in the PM’s chair just before the next elections, wouldn’t you? If that happened, the Green Man would have to resign. There would be a right royal battle among the Greens to elect a new leader. It would have been like JR depriving the Queen Bee of her civic rights and the Blues fighting over who should be the next leader. It would have divided the Greens hopelessly. Of course, it all depended on you getting the numbers to oust the Green Man. You entrusted that task to the Trojan horses loyal to you in ‘yahapaalanaya’, the likes of Susil, SB, Dilan and Thilanga. They were boasting that there were more than enough Greens who would vote to get rid of the Green Man. Even on the day of the vote, many thought it would be the Green Man’s final curtain call. Why, that Udaya chap who has a habit of opening his mouth and putting both his feet firmly in, said that the Green Man would be sent home as sure as the sun would rise. He must be in a dark place right now! In the end, Mahinda maama, it wasn’t even like a T20 thriller decided by the last man. The Green Man was home and dry. Not only did your Trojan horses fail to deliver the Green votes they promised you, they couldn’t get all of Maithri’s blue chaps to vote for you: they were all conveniently absent. Now, the Greens are demanding that those who voted against the Green Man should leave the government. I think that is a fair call because anyone with an ounce of shame shouldn’t remain in a Cabinet if they don’t have confidence in the PM. But then, an ounce of shame is a lot to ask for! Just a week after you brought the vote to try and split the Greens, the Blues are hopelessly divided. Some want to remain with Maithri and in the Cabinet, others want to stay with Maithri but not in the Cabinet and yet others are with you. 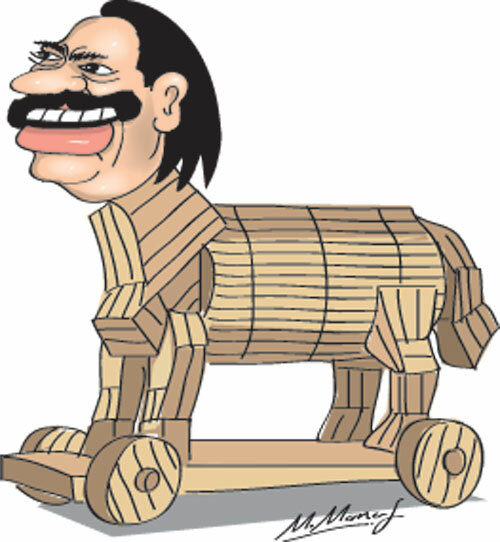 Ah, what a mess you have created, Mahinda maama? Those who voted against the Greens would leave the Cabinet and the government, we are told. Ah, won’t the Greens like to see the back of the likes of Susil, Dilan, Dayasiri, SB and Thilanga who were constantly sniping from within? So, now it looks like you may have done the Greens a favour! What’s more, the Greens have been energised by everything that happened. Now they are like the Sri Lankan team under Hathurusinghe. They are hungry for victory and are making changes, promising a new look and a new attitude because they know that if they don’t change, they don’t stand a chance. Knowing the Green Man, those changes have to really happen before we can be sure that they will occur. Otherwise, he will appoint a committee to look into it and by the time the committee sits and reports on the matter, everyone would have forgotten about it. Still, the Greens have made a start. Mahinda maama, you wanted to divide the Greens, unify the Blues and have someone from the Blues sit in the PM’s chair. Instead, the Green Man is still in the PM’s chair, the Blues are divided and the Greens are getting their act together. At least this time, the Green Man has outwitted you, hasn’t he? PS: Mahinda maama, you will have a suba aluth avuruddak because you won the recent elections. The Green Man will have a suba aluth avuruddak because he survived the no-confidence motion. Maithri will have a suba aluth avuruddak because he is still the boss. Unfortunately for the rest of us, it won’t be a suba aluth avuruddak because of the big mess all of you have created in this country!